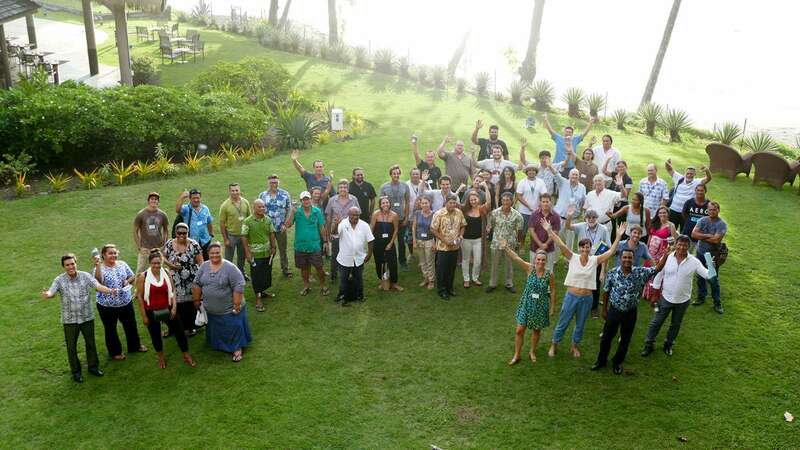 The focus was to share and discuss manaʻo (knowledge) from around the Polynesian triangle on contemporary co-governance and co-management efforts from their cultural, legal and political foundations. This included a discussion of the development of a Polynesian network. KUA and the Fiji Locally Marine Managed Area Network (LMMA) presented for a discussion concerning the concept of a pan-Polynesian Network. In Tahiti, like many other places in the world, communities are picking up the ʻauamo (the palanquin, carrying stick used to help a person or group leverage a heavy burden). Before the four-day workshop commenced we visited Teauhupoo in Tahiti iti (small part of the island of Tahiti). Known for it’s famous surf break, Teauhupoo, for many Tahitians, is becoming famous for the revival of a tradition. The Teauhupoo community has revived the practice of rāhui which generally means prohibition (similar to Hawaiian lāhui defined below). Lāhui 3. vt. To prohibit, forbid, lay a taboo, proclaim a law (possibly -i is a transitivizer; cf. Gram. 6.6.4 and Samoan lafu, to prohibit). Lāhui ʻia ka walaʻau e Pele, loud talk was prohibited by Pele. hoʻo.lā.hui To cause to be consecrated; to taboo. (PNP lafu, PCP laafui.). 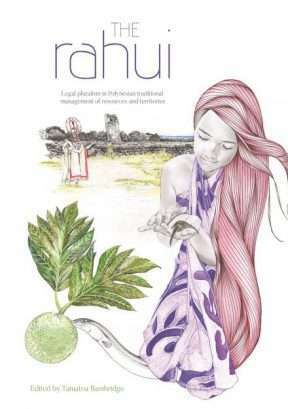 Rāhui is a political tool to manage resources for abundance. In Tahiti, RĀHUI was the word. 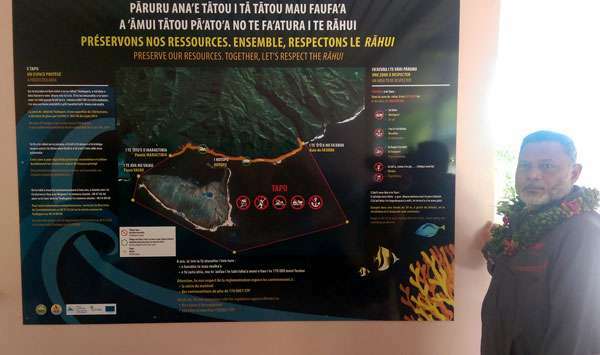 The general concept is much easier to grasp culturally than Hawaiʻi’s designation of “Community-based Subsistence Fishing Areas,” and it is being revived in a contemporary way. By the grassroots, the people, the native community, the traditional stewards of their places. The Teauhupoo Rāhui would not exist if not for the people’s desire to have more say over their lives and resources. At Teauhupoo in 2013, the community primarily led by fishermen decided they needed a rāhui. They organized and worked with Teauhupoo mayor Gerard Parker to create it. Patrick Rouchette, a community, cultural leader and fisherman of Teauhupoo said the idea of revival of a rāhui had been a long time coming. There was a strong desire, but like in Hawaiʻi and many places the effort, especially the first few, can be a struggle that required a few strong and willful leaders to step up to the plate. Like Hawaiʻi, Tahiti’s government is trying to adapt and catch up with the people. Regardless of government capacity the community in Teauhupoo decided to create their rāhui. They met, deliberated and found common ground. They then did targeted and broad outreach, held large and small meetings and did one-on-one door-to-door talk story sessions in their 16,000-member community. Like the Hawaiʻi community experience, the community of Teauhupoo continues to have and meet challenges in outreach and enforcement. Despites challenges the community makes progress and direction of things, they keep going. By exercising responsibility they are bringing the government around to their view. Today, the greatest initial objector to the creation of the community rāhui, a fisherman, is now the most vigilant and primary supporter and guardian of the area–so much so that he came out to visit our boat to check on why we were there. Tahiti, a part of French Polynesia, has its own government/governor but it is also governed by France. Similar to the metaphor of open veins–used by scholar Eduardo Galleano in his seminal study on historical resource exploitation in South America–Tahiti’s resources were thrown open to the world. Little thought was given to the consequences to the people most interdependent on the place. As is said in Hawaiʻi, with very little nuance, all fisheries are said to be “open fisheries” in Tahiti. The challenge of community establishment of rāhui, then, is similar to the Hawaiʻi experience. It takes a contemporary bottom-up approach–the empowerment of people, their relationships and their traditional values and management practices to influence the context. As one of our elders Uncle Mac Poepoe likes to emphasize: it is not about rules it is about changing behavior. We may emphasize rights in our law but it doesn’t mean we as a community can’t shift the context to address our responsibilities too. Another similarity Hawaiʻi shares with Tahiti is the shift in authority systems. In most of Tahiti and French Polynesia the ariki (chief) systems have largely diminished or been weakened. Chief like leadership, however, continues to mana-fest itself in the community leaders, municipalities and the mayors that lead them, especially in rural areas. Leaders like Teauhupoo mayor Gerard Parker and a number of mayors from French Polynesia also attended the workshop to consider rāhui in their districts. Through sharing and exchange with these leaders, I learned that half of Rapa (an island of 500 people in French Polynesiais) is a rāhui, which is closed all year except for one day. 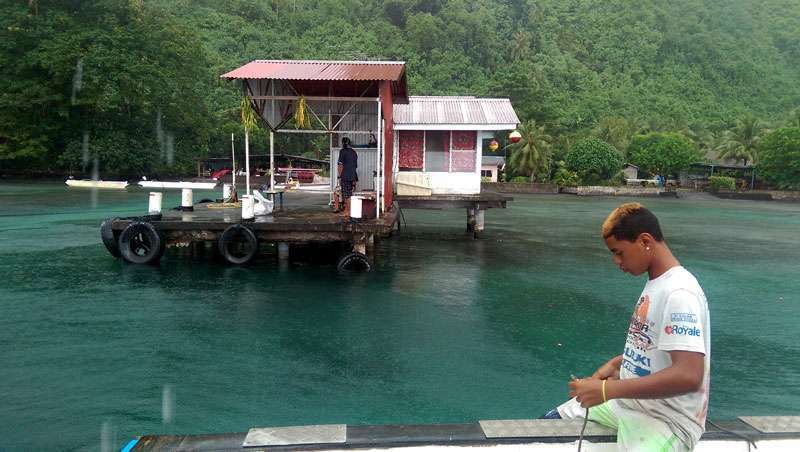 Communities fish on the non-rāhui side of the island. On the one open day designated fishers go out and gather and bring the catch home and share it among all the families. Rapa and the island of Huahine, like Hawaiʻi also have fishponds!!! 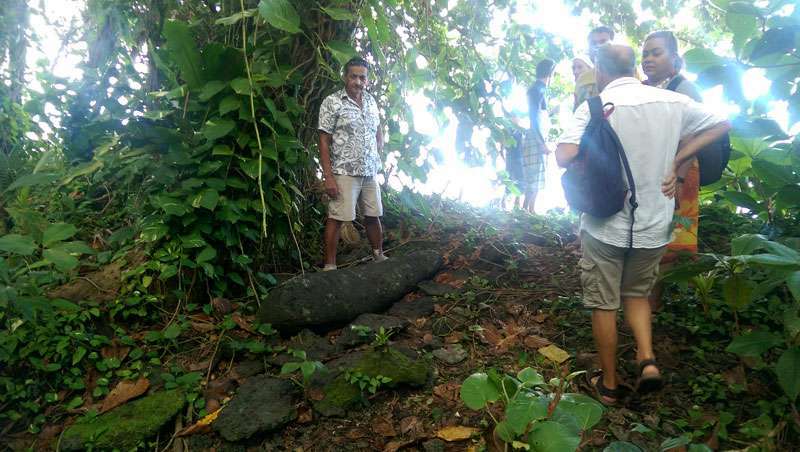 Another highlight was on the day at Teauhupoo when the Mayor Gerard Parker, research anthropologist Tamatoa Bambridge, and cultural leader Patrick Rouchette took us on a short walk to the end of the rāhui–the ground filled with crab holes bigger than any Iʻve ever seen in Hawaiʻi. The walk ended at what they called the puna stone. In Hawaiʻi we have something similar, often called Kuʻula stones or koʻa–fishing spots/shrines for the fishing god Ku’ula kai. The puna marked the end of the rāhui and used to be an indicator for fishers. When one end of the puna faced a certain way it meant the fishery was plentiful and open; faced in the opposite direction, it meant fishing was prohibited. Kuʻula stones in Hawaiʻi can often be found standing on the shoreline or at old settlement areas including wahi pana. In Tahiti, the puna stone is lain down. The Teauhupoo community has continued to educate themselves and surrounding communities about their rāhui. Just like in Hawaiʻi, fishermen have begun to map, document and identify special areas, traditional names, significant spawning seasons and nurseries. Young native and local researchers help the process, contribute to and grow from the experience to re-shape how science can be used as a practical tool for real world issues and meaningful future employment at home. Teauhupoo is planning a Rāhui network and the community hopes to set up 6-8 more rāhui in the coming future. 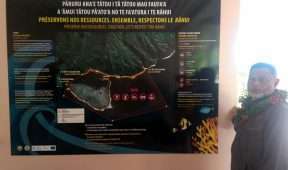 To close the workshop, research anthropologist Tamatoa Bambridge’s students reported back to French Polynesian Fishing Ministry Officials a summary of our findings and offered heartfelt encouragement to further community co-management for the purpose of taking care of future generations. KUA was there as a guest, in part, because French Polynesia is taking notice. The world is taking notice.